When you send your air-end to a company to have it rebuilt, do you get a piece of paper with no more information on it than what it is going to cost to rebuild or do you get a full technical evaluation, complete with photos, showing the damage inside your air-end and explaining what needs to be done regarding repair? There is a company out there that is now giving you this choice. The PROfessionals at The PROS Company out of Lubbock, Texas, does a full technical evaluation on every air-end reconditioned. They will furnish you photos and give an explanation of the damage and what will need to be repaired. The art of air-end forensics is actually more of a science than an art. It takes years of experience and knowledge of the interworking of air ends to be accurate. Air ends do not have a lot of pieces, but the pieces they do have are specialized and rotate at high speeds with close tolerances. When the smallest thing goes wrong, you can have a major problem. There are always clues to what went wrong. Putting all the clues together and presenting the results in a technical evaluation is most important to being able to make an informed decision on whether to rebuild an air end or to replace it. It is always interesting to see what you will find inside of an air end when you disassemble it. Looking for clues and taking photos is vital for a good forensic report. A small scratch or discoloration of metal could tell you the story about the history of the air end. Sometimes it takes further analysis with a microscope to tell the full story. We once had an air end and the bearings showed the classic pattern of electrical arcing as the cause of the failure. We decided to send the bearings to the manufacturer for further analysis. The manufacturer did microscopic analysis on them and found two different solid particle contaminates in the bearing causing the visible damage. This completely changed the results of the technical evaluation and showed that external contamination was the real culprit. Below is the conclusion to the report from the bearing manufacturer. No evidence of electrical arcing appears in or on these bearings. Indentations on the raceways may have been mistaken for arcing damage. Another feature that could be misconstrued as arcing damage is small galled patches on the mated side faces of the two outer rings. Solid particle contamination and related damage could account for the excessive vibrations from the equipment, but the source of vibration may be unrelated to the bearings. Both bearings display evidence of solid particle contamination. Dents and scratches are present in the load zones of both rings. Some of the dents are smooth bottomed, while others exhibit rough bottoms. These conditions indicate that some of the particles had ductility but others exhibited brittle behavior. Damage to the rolling elements also supports the presence of solid particles in the bearings. The balls are scratched and the rollers exhibit scoring and pronounced grooves. 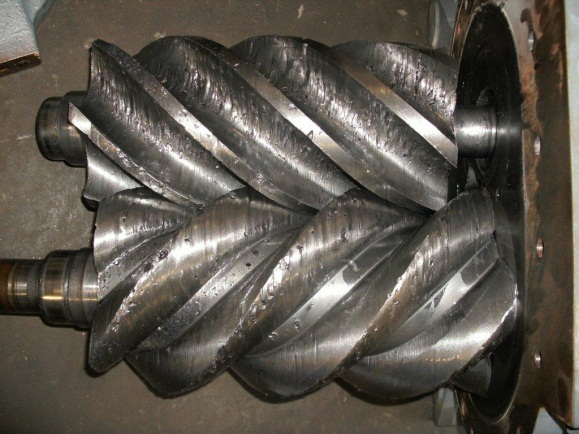 The scoring and grooves on the rollers are typically due to particles that are forced through or become lodged in the cage pockets. Several of the cage ribs do have embedded metal particles. Since there is no spalling in these bearings and neither cage is broken or excessively worn, the source of the particles must lie outside the bearing. A few small galled patches are present on one side face of each outer ring. Galling is an adhesive wear mechanism that causes material to be pulled from one surface and deposited on the other as one surface moves relative to the other. The appearance can be misinterpreted as arcing damage. The galling damage features on the faces of these two rings are mirror images of each other. This and the outline of notches on the cylindrical roller bearings side face establishes that the bearings were mounted against one another. With Reports Like This, the Full Story is Told. Other not so common problems are chemical corrosion issues. Some air-ends we have reconditioned have evidence of chemical corrosion from the environment they are exposed to. The damage is more of a pitting and flaking on the bearings then scratching and scuffing. The meshing of the rotors is another place where very tight tolerances are of great importance. If external contamination enters the air end, there is a high possibility that there will be damage to the rotors. Scarring, pitting, and normal wear of the rotors will make the air end less efficient. Excessive damage to the rotors will turn them into scrap iron. New sealing strips can be put on rotors, but damage to the rotor profile is less likely to be repairable. In conjunction with damage to the rotors is normally damage to the housing. With the advancement in welding procedures, most housings are repairable. A good technical evaluation will have detailed photos and descriptions of the damage and what needs to be repaired. With air compression and rotating parts, heat is generated and is a constant companion. The oil-flooded air end uses the oil to help control the heat and remove it from the air end. When this balance is upset and heat builds up in the air end, damage will occur. The excess heat will cause thermal expansion of the rotors. The rotors will then start to rub the housing in many different places. Most common is the air gap, the discharge face and the interior of the rotor housing. When doing the forensics, excessive heat leaves many different clues. Burnt oil residue looks like molasses and will be in every nook and cranny not scraped off by moving parts. As the rotors continue to heat up and expand, they will come into contact with the housing. This will create more heat buildup and damage. Then there will be evidence of metal parts scraping against each other. If the air end is not shut down, the heat will build with more thermal expansion of the housing and rotor, thus eliminating any close tolerances that were there. The metal will liquefy and when the unit does finally stop rotating, the liquefied metal will weld the rotor and housing together, locking the unit up and resulting in a catastrophic failure. Forensic evidence is really obvious at this point. The air end rotor will then have to be surgically removed with a custom-made saw and our oversized drill press. If the inexperienced rebuilder tries to press the rotor out of the housing, he/she will break the housing and make the air end owner buy a new one. Sometimes what is not there is just as important as what is there. We have found missing parts that a previous rebuilder forgot to install or maybe thought was not important. Most common are spacers and seals. We find multiple shims installed instead of making a spacer. The most comical was a combination of washers and shims (not all the same sizes) that replaced a spacer that was almost 3/8 of an inch in thickness. An effective manager will take the information provided from the technical evaluation and use it to prevent similar problems or to improve on the preventative maintenance program. One customer keeps a file on each air end and will put the technical evaluation in the file each time it is rebuilt to compile a more complete history. Here is an actual response from a customer on the technical evaluation and resulting quotation - “Another VERY good analysis. We can sell & justify this kinda work every time! Get er' dun! Thx!!!”. It makes your job much easier to justify to other managers or customers if you are able to fully inform them when the time comes for approval to spend money that may have been budgeted for something else. A well-written technical evaluation with good forensic data is a valuable tool to have in your toolbox. In summary a well-prepared technical evaluation will have lots of photos of the forensic evidence and good descriptions of the damage. With this information, the decision maker is much more informed to make the best economical choice for the company. The technical evaluation is a tool that will create a win-win situation for all involved.